Artist/Author: Howell, Steve N. G.
If you travel the open ocean anywhere in the tropics, you are very likely to see flyingfish. These beautifully coloured “ocean butterflies” shoot out of the water and sail on majestic, winglike pectoral fins to escape from predators such as dolphins, swordfish, and tuna. Some can travel for more than six hundred feet per flight. Yet despite their prevalence in warm ocean waters and their vital role in the tropical food chain, surprisingly little is known about flyingfish – more than 60 species are said to exist, but nobody is sure of the number. This beautifully illustrated book presents flyingfish as you’ve never seen them before. 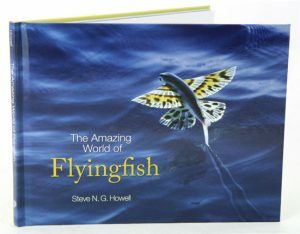 It features more than 90 stunning colour photographs by renowned naturalist Steve Howell, as well as a concise and accessible text that explores the natural history of flyingfish, where they can be found, how and why they fly, what colours they are, what they eat and what eats them, and more. 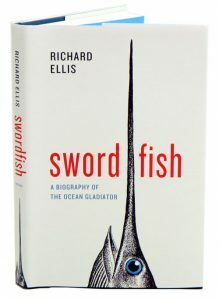 Ellis’s detailed and fascinating, fact-filled biography takes us behind the swordfish’s huge, cornflower-blue eyes and provides a complete history of the fish from prehistoric fossils to its present-day endangerment, as our taste for swordfish has had a drastic effect on their population the world over. Ellis shows us how the bill is used for defence–contrary to popular opinion it is not used to spear prey, but to slash and debilitate, like a skilful sabre fencer. Swordfish, he explains, hunt at the surface as well as thousands of feet down in the depths, and like tuna and some sharks, have an unusual circulatory system that gives them a significant advantage over their prey, no matter the depth in which they hunt. Throughout, the book is graced with many of Ellis’s own drawings and paintings, which capture the allure of the fish and bring its splendour and power to life.